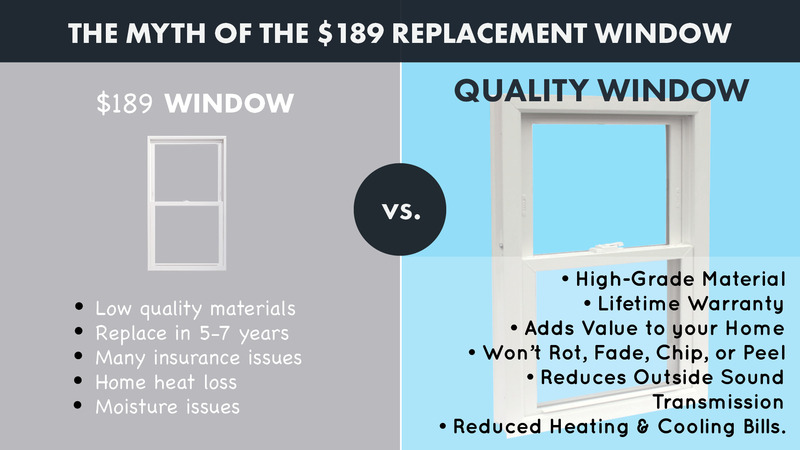 There are many myths behind the $189 replacement window that might make homeowners think twice. Even though these windows can easily fit within an exterior upgrade budget, things aren’t always what they seem with this replacement window option. If a homeowner were to purchase a $189 replacement window, they might be a bit disappointed the next time their utility bills are due. While replacement windows can certainly save homeowners a lot of energy—over $400 per year in some cases—don’t expect much from the $189 window. This is because the $189 window does not include any energy saving features such as argon or krypton gases. These gases are a key component to increasing the energy efficiency of your home, resulting in exceptional energy savings throughout the year. Furthermore, $189 windows don’t include low-e glazing. Low-e glazing is designed to reflect interior temperatures back inside, keeping your home warmer in the winter and cooler in the summer. If you want to include any of these features in your new windows, the price will substantially increase. Without including these key features, it doesn't make sense to replace your windows. Aside from reducing drafts, windows without gases or glazing won't offer maximized energy savings. If you're attracted to a low-performing window due to price, a quality window company like Universal Windows Direct, will have an efficient window to fit any budget. In the world of replacement windows, you essentially get what you pay for. Another reason why $189 windows are so cheap is because their vinyl contains filler ingredients. These ingredients allow manufacturers to drastically reduce the cost of the window—but this spells trouble for homeowners. Replacement windows that contain a lot of filler wear out much faster than high quality vinyl windows. What should you look for? Replacement window frames made of 100% pure virgin vinyl. You'll get a much longer lifespan for your new windows, to the tune of roughly 20 years. Meanwhile, $189 vinyl windows will perform for roughly 5-7 years as a lower quality product. Vinyl frames that quickly lose their color. Frames that are peeling, chipping, or warping. Foggy windows that won’t wipe away, indicating seal failure. Your windows are difficult to operate. Your energy bills are high, even after new window installation. With quality windows, you can see and feel the difference. Window samples that demonstrate distinctive quality are usually provided during your in-home estimate. When you are given the price of a $189 window, that price represents the cost of a plain window with no upgrades or features. Not only is the window missing energy saving features, you aren’t getting any style options either. You’re ordering really big or really small windows. Size matters with pricing. You want a window style that’s a bit more elegant and intriguing. For example, large windows such as bay and bow, require a different type engineering than a single double hung window. With a more complex process for these windows, as well as, for uniquely -shaped windows, the price will increase accordingly. You’re considering different frame materials. Vinyl is the most affordable material while wood is the most expensive. You’re looking to add custom grid and window trim options. You want to complete your window with a decorative glass design. One of the best parts of replacing old windows is that you can get new, beautiful windows custom designed exactly how you want them to look. There are countless combinations of glass styles, grid options, paint colors, and wood finishes that you can choose with your home in mind. These aesthetic features can transform a home, but will never be an option for only $189. Adding a new window into the wall where there was no existing window previously. You ordered a new window that’s wider or taller than the existing window, so space needs to be created in the wall in order to fit the new window. You want the best in energy savings, so you decide to upgrade to triple pane windows over dual pane. The installation team detects lead paint that needs removed from old frames. The reality is that companies advertise $189 windows to get their foot in your door, with the overall goal to upsell you on various features. Once you add energy saving glass packages and custom aesthetic designs, your $189 window will be significantly more expensive. How does this happen? One of the biggest factors is window style. With $189 windows, only select styles are included. Often, it’s the double hung window. If you had your heart set on another style such as a big bay window, you might be disappointed at your final quote. Don’t forget, a warranty is built into the cost of your windows as well. A $189 window implies that there is no warranty at all. This is a dangerous gamble. You may need follow-up services to address a variety of potential issues a cheap window might induce. A warrantied window will cost more, but you’ll have protection for many aspects of the window—-including the details you don’t think about, such seal failure, pieces and parts of the window. FYI: Not all window advertising is misleading. Sometimes you can legitimately save money during special promotions or offers. You could even make a quick buck by referring a friend. By now you know that $189 windows aren’t all they’re cracked up to be, but what are the exact factors that influence the price of quality replacement windows. It’s your investment, you deserve to know how your money is being spent. Think about the time you went to Sam’s Club or Costco and received a great deal on a box of K-cups for your Keurig coffee machine. Buying in bulk helped cut down on the cost for the convenience. Next, think about the time you went to a local coffee house and sipped a delicious latte. It was more expensive than what you pay per K-cup from your bulk shopping trip, but the quality and experience is unbeatable. Just like your bulk K-cups, $189 windows are often produced in bulk. This mass production makes the window a lot cheaper for you, in the long run however, you will lose when it comes to the quality of your window installation and performance. But just like your latte, custom windows are made to order---every single one of them. Uniquely-shaped window sizes are carefully engineered to fit the exact specifications of the opening, since getting the fit just right makes a difference on your energy bills. Manufacturing doesn’t only account for the size and shape of a window. It also includes the quality of welding, reinforcement to strengthen the window, and even the smallest pieces and parts that make up the entire unit. Remember, just like your barista, there are workers who spend a lot of time making these windows at the manufacturing plant. They are paid well to make sure your windows are perfect before they’re installed. You might not think about the quality of the locks and weatherstripping of your windows, but trust us when we say that this makes a difference in both performance and price. While good weatherstripping won’t cause the price of your window to skyrocket, the good quality products are an added expense. Think about buying a winter coat and quality of the zipper. Do you really want to deal with a coat zipper that gets stuck open when it’s freezing outside? This is the type of quality and functioning we’re talking about with your windows. Locks and weatherstripping work together to seal your home from the cold and keep energy bills low. If these components are not up to quality standards, you’ll see and feel the difference. There is a fine balance of ingredients needed to make a quality vinyl window frame. When it comes to vinyl, add too much of one filler and you’re looking at bad framing that won’t last long. The good ingredients are costlier but proven to last. We can use the winter coat example again when it comes to glass. If you live in Alaska and you’re looking to buy a coat, are you going to choose a light jacket with no insulation, or will you get a coat that’s filled with down and made of weatherproof material? A $189 window is essentially the equivalent to a spring jacket, while a window with an insulated glass package is the warm winter coat. A big difference in cost, yes, but the price is worth the comfort. Windows are attractive products. What’s awesome is that they come in such a wide range of styles, frame colors, sizes, and even glass and grid options. It’s almost like buying jewelry. If you buy an 18-karat gold band, you might decide to set a few stones for embellishment. There is an extra cost for the stones, like diamonds and rubies. A plain 18 karat gold band will cost less and still look beautiful, but adding some sparkle to it will make it truly unique. With custom windows, you can add these special touches through decorative glass and grid systems. Just like the gold band vs. diamond ring, greater investment will add timeless beauty to your home. Lastly, and we can’t stress enough, professional installation is one of THE most important factors when it comes to the performance of your new windows. Skilled, certified, and insured installers cost more for labor than those who do not have experience or insurance. Would you pay an apprentice carpenter the same as one with 20 years’ experience to build your house? Quality and professional window installation yields years of energy savings, beauty, and unrivaled performance. The best way to know the cost of your new windows is by contacting us for a quote. While we might not advocate $189 windows, our affordable pricing structure (good, better, best) allows homeowners to choose the best quality replacement, while staying within budget. 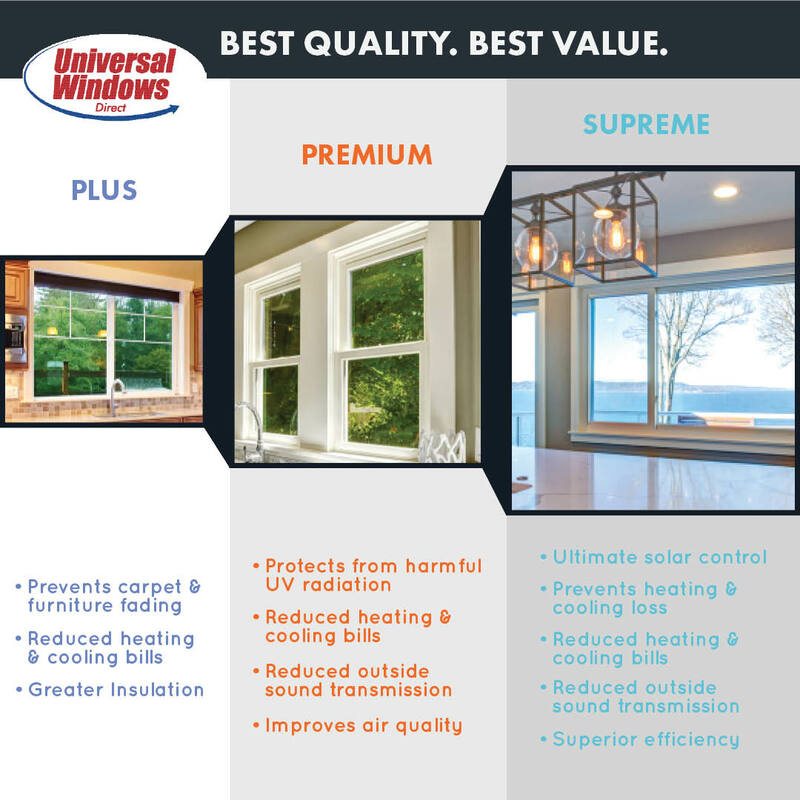 Contact Universal Windows Direct today for fair and honest pricing at 855.395.9377.